Japan. 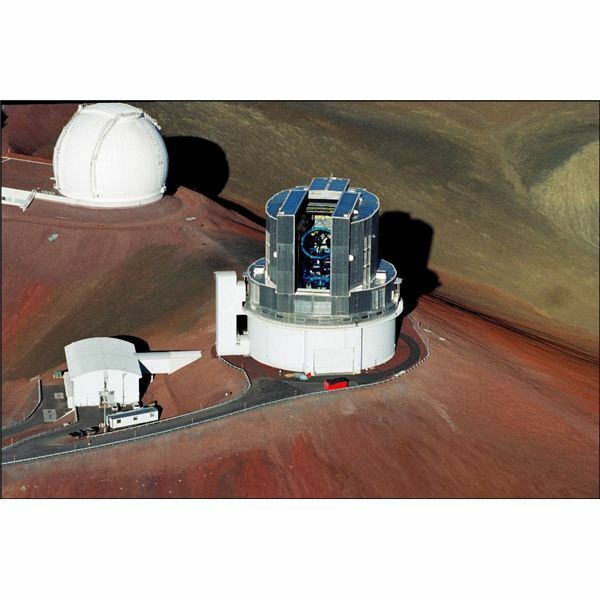 Mauna Kea, Hawaii, at an elevation of 4139 m (13,508 ft) was chosen for the site of this new observatory to take advantage of almost ideal viewing conditions for infrared and optical astronomy. To make the most of this optimal site, Subaru was designed with a primary mirror – 8.3 meters in diameter, the largest single-piece mirror in the world to date. Most telescopes under construction since have used segmented mirrors instead of a monolithic primary mirror system. 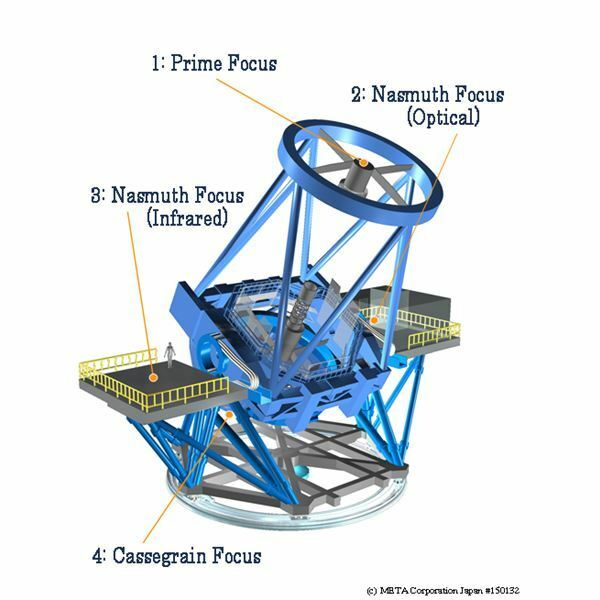 Seeking a more engaging name for the telescope, Subaru was chosen after a survey was conducted for an alternative to the NJLT. Subaru is the Japanese name for the Pleiades, an open star cluster sometimes also know as the “Seven Sisters"
The primary mirror of the Subaru telescope is made from an ultra-low thermal expansion glass and has an active area of 8.2 meters. This single mirror weighs in at slightly over 25 tons. 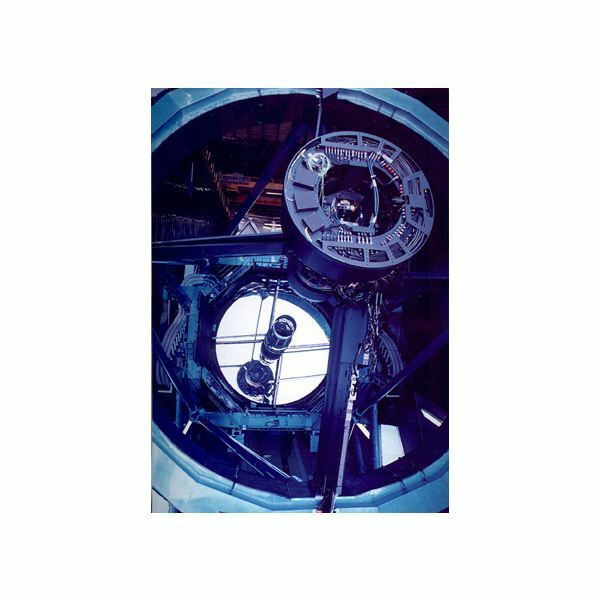 The telescope is a Richey-Chretian system and provides four positions (Primary Focus, Nasmyth Focus – optical and infrared, and Cassegrain Focus) for observations and/or placement of equipment such as spectrographs and cameras, as can be seen in the image below. The overall size of the telescope structure is 22.2 m (72 ft) high by 27.2 m (89 ft) wide. view equivalent to that of the full Moon—about .5 degrees, or about 30 arcminutes. 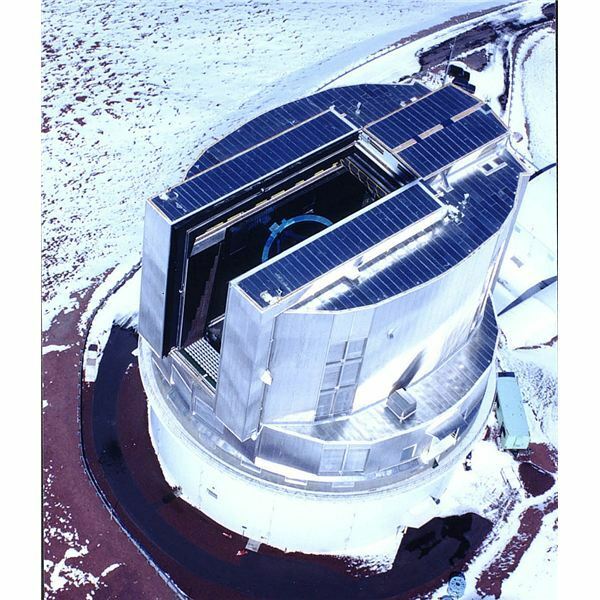 The telescope uses a 188 element adaptive optics system with a laser guide star to compensate for atmospheric distortion during its observations. This system was installed in 2006 and gave the telescope a factor of 10 improvement over its predecessor, which was only a 36 element system. Typical resolution is about 0.6 arcseconds with the new adaptive optics; although the best recorded was 0.2 arcseconds. The observatory that houses Subaru is as unique as the telescope itself. The structure is elliptical in shape to improve airflow around as well as within the structure, and it rotates with the telescope. This is impressive since the observatory about 43 m (141 ft) high, with a base diameter of 40 m (131 ft) and weight of 2205 tons! The image below shows the observatory with the shutter open for viewing. The deep blue "panels" on the top of the observatory are not solar arrays, but shiny aluminum panels reflecting the deep blue sky that is visible at the elevation of 14,000 feet. In the bottom of the observatory are facilities to provide maintenance and support for the telescope. At the time of writing this article (August 2010) the primary mirror is going through a cleaning and re-aluminization process. This is typically about a 3 week process, but this year they are doing additional work and upgrades on the telescope, and it will be out of service from July to the end of September. The re-aluminization process requires that the primary mirror—all 25 tons of it—be removed from the telescope and lowered into the lower levels of the observatory for the work to be done on site. The telescope is used for infrared and optical observations and it achieved first light for scientific observations in January 1999. Below is a gallery of just a few of the amazing images taken by Subaru. 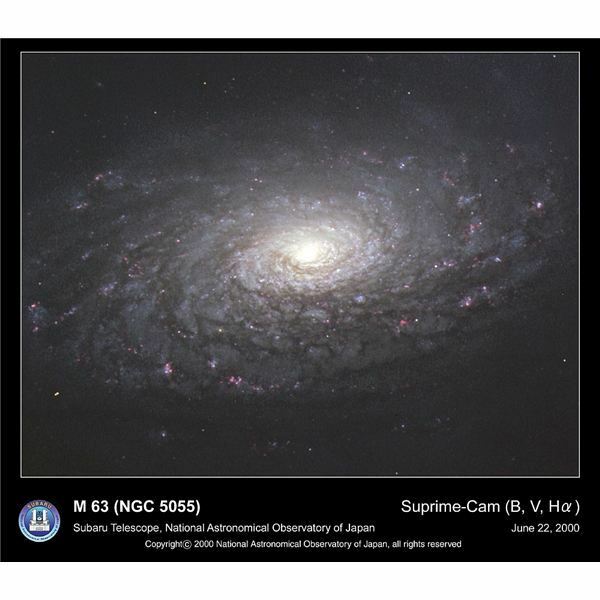 On the far left is the beautiful spiral galaxy known as the Sunflower Galaxy, NGC 5055 (M63). At a distance of 37 million light-years, it is part of the Whirlpool Galaxy (M51) group, and can be found in the constellation of Canes Venaciti. In the middle is an image of the active galaxy NGC 4388, which is part of the Virgo cluster, and is at a distance of 60 million light years. The wispy cloud gas above the galaxy, shown in red, is over 110,000 light years across, and may be the remnants of a smaller galaxy absorbed by NGC 4388 or possibly the remains of gas that was left behind as the galaxy made its way into the Virgo cluster. 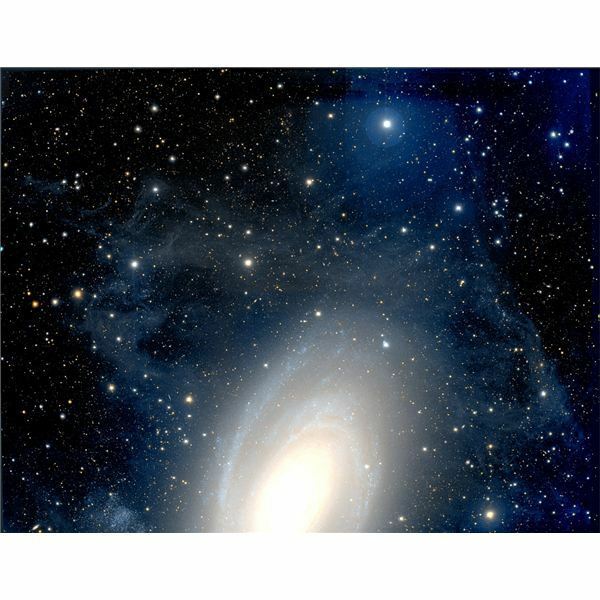 The image on the right is a visible light image of the spiral galaxy M81, located in the constellation Ursa Major. It is one of the brightest galaxies in the night sky with an apparent magnitude of 6.94, even at 11.7 million light years from Earth. This image shows the immense halo that surrounds the main galaxy, consisting of dust, gas, and uncounted unresolved stars that may lend credence to the theory that large galaxies form by the accretion of smaller galaxies, this halo being the residual material from these events. 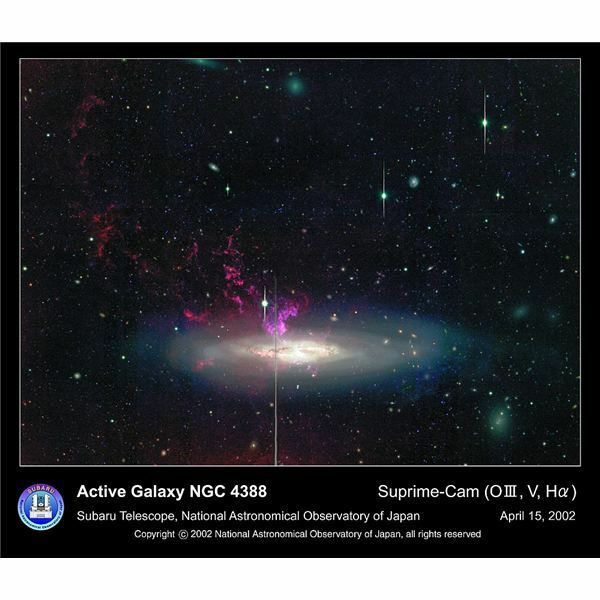 Using Subaru’s Suprime-Cam, astronomers were able to show details in the halo that had not been observed before. Just recently, papers have been published on the discovery of the first Trojan asteroid at a Lagrangian point of Neptune, and dark gamma ray bursts using the Subaru telescope to gather the critical data. Subaru has earned its place in the annals of remarkable instruments in the study of astronomy and cosmology. We can only look forward to more insights about the universe in which we live, as it continues to peer into the depths of the cosmos.